As the need for mobile apps developers increases and interest in computer science courses wanes, professional educator-programmers are reaching out to a younger generation of potential coders: students as young as 10. 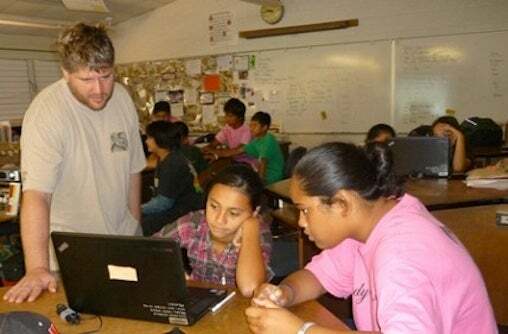 In Utah this week, two programmers from the nonprofit TeachingKidsProgramming.org are holding workshops at seven schools around the state to expose students and teachers to C# (C-sharp) programming. The curriculum the programmers will share with the Utah students is based on a free online curriculum that they developed for Pluralsight that was originally intended for use by professional programmers to share online with their own children at home. Pluralsight, a private company, primarily offers online coding courses for professionals for a fee, but the online C# course is free and doesn't even require registration. The C# course is offered along with two other programming courses for children and young people called Scratch and App Inventor. Coding curriculum co-creator and instructor Llewellyn Falco helps students as they learn computer programming. "Programming is not being taught in schools," said Lynn Langit, a former Microsoft developer who co-wrote the C# curriculum with Llewellyn Falco. "In the U.S., with some exceptions, programming is only introduced in high school as an Advanced Placement course and very few students see programming courses until college. Around the world, basic programming is part of a basic education." Langit and Falco have taken their coursework to other countries and have developed a teaching framework based on experiential learning, Langit said. "We teach programming almost like an art class, and students create their first executable program in three minutes," she said. The only requirement for their students is an ability to type, which some master at a very young age. The role of the parent in the C# course can be undertaken by a teacher or even a volunteer in an after-school class, she noted. "We make it fun. Some kids glom onto it," Langit said. "Denying kids the opportunity to see what programming is all about is not serving kids well." That's especially true as an entire global apps economy is growing to put different apps on smartphones and tablets, said Aaron Skonnard, the CEO of Pluralsight. "Computer programming is the new international language of business, and we're not teaching it in schools. Why is that?" he said. "There's a big-time need for app devs for mobile," Skonnard said. "Teaching kids programming around mobile could be the secret sauce." Part of the purpose of this week's workshops is to show how easy the curriculum can be for teachers and parents, he said. "But we want to show that anybody can do this course," he said. "We're really committed to helping with this effort, to help inspire the teaching of programming at younger ages. I have a hunch it will go really well." Skonnard estimated it costs his company about $100,000 a year to commission free courses and to pay instructors to write and buy copyrights from them. The nine-year-old private Pluralsight has 45 employees and last year had $16 million in revenues from 250,000 professionals globally who subscribed for online training. Year-over-year growth has averaged 100% in recent years, he said.